If you’ve sold gigs on Fiver before you probably know how much time crunch you’re under. A gig may sell for $5 but you only get $4 sent to your Paypal. Subtract 8 sents for Paypal’s fees and you’re left with exactly $3.92. 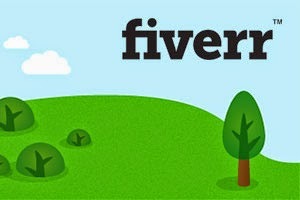 For buyers the site’s name “Fiverr” is accurate but for sellers it’s not. So how do you deliver a gig for $3.92 while still making enough money to cover your expenses? You calculate a good hourly wage for what it is you do. Time yourself to see how much it takes you to deliver each gig. If it takes you 20 minutes to write an article, and the next day it takes you 30 minutes, and the next day it takes 25 minutes, it would be safe to safe you’re writing an article in half an hour. That’s $3.92 every half hour or $7 an hour. From there you would measure your expenses to sit down and deliver a gig. You might decide that your hourly rate should be $16 an hour. Then you can calculate your current words per minute, to come up with a rate that will get you $16 an hour writing articles on Fiverr. It’s as simple as that. In the long run you will learn that you can’t just complete gigs without thinking about the time it takes to deliver them. 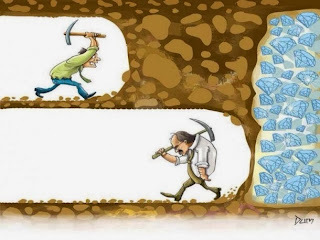 You will realize that you’re under a time crunch no matter if you’re on Fiverr to become rich or just to have some fun. Calculating your time and figuring out how much you should be charging is a one time thing. But if you want to remain efficient or become more efficient you will have to track every gig and the time it takes to deliver it. It might sound crazy to time each gig and to record everything. But it’s easier than you think. I use a program called Grindstone. It lets you setup tasks which can than be timed. “Write an article” start the timer and you automatically see a small timewatch counting time. By having the timewatch on your computer you’ll be more time conscious. If you need to leave the computer or pause your work you can just press pause on the timer. By using Grindstone you can easily time every single second it takes you to deliver your gigs. Using Grindstone itself takes about 30 seconds from creating a new task, starting the timer, and managing your tasks. The best part about this program is that it produces really cool reports. So if you need to know how much time it takes for you to deliver your gigs you can generate a breakdown of your tasks, or a time sheet. From there you can export your timesheet into excel or something other program and average up all the time it takes for you to complete those gigs and the profit you’re making. In the long run using a program such as Grindstone will make you think about time more while working on your projects, resulting in less distractions and an outlook on being efficent. I don’t complete a single task without logging it into Grindstone now. I can keep track of everything I do from completing gigs, doing homework, and more just by using this nifty little tool. If you do a lot of different things everyday and don’t know where to cut down on to get more time, than Grindstone will really help you out. You can also try RescueTime to see how you’re getting distracted and how you spend your time on the computer. RescueTime won’t be as useful in logging certain tasks, it will just monitor the programs and sites you look at and for how long. So that’s my take on completing work on Fiverr. Feel free to leave a comment with your thoughts. Do you monitor the average time it takes to deliver a gig?